The full report is published on Thursday but excerpts were issued ahead of publication by NHS Health Scotland. Researchers looked at the number of deaths and hospital admissions caused by alcohol consumption in 2015. It also looked at what people were dying from or the alcohol-related conditions that were making them ill. It also discovered that 41,161 patients were admitted to hospital due to alcohol in 2015, with accidental injuries accounting for more than a quarter of that total. 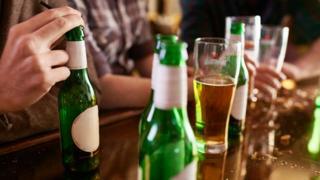 Elaine Tod, public health intelligence adviser at NHS Health Scotland, said: "Overall, the results tell us that alcohol consumption has a significant impact on health in Scotland - in fact, it contributed to over 100,000 years of life lost due to early death or living in poor health in 2015. "Alcohol has a wider impact on our health than many people think. "Reducing harmful alcohol consumption will reduce this impact and that would benefit everyone: drinkers and non-drinkers, children and families, communities, the NHS and emergency services, employers and the economy. "Preventative action is necessary if Scotland is to make long-term reductions in alcohol-related harm." Prof Linda Bauld, Cancer Research UK's prevention expert, said the figures are concerning. "Alcohol is linked to seven types of cancer including breast and bowel cancer, and the more you drink the greater your risk of cancer," she said. "Yet we know public awareness of the link between alcohol and cancer is low. Much more needs to be done to increase public understanding. "And a wealth of evidence shows that a minimum unit price for alcohol will save lives in Scotland and we hope this important policy will be put in place as soon as possible." Public Health Minister Aileen Campbell said: "This report highlights not just that excess alcohol consumption in itself kills, but that it contributes to so many diseases and conditions that can lead to poor health and early death. "While huge progress has been made in recent years in tackling alcohol misuse, we want to go further - which includes Minimum Unit Pricing for alcohol which will be introduced in May this year. Our framework for action outlines more than 40 measures to reduce alcohol-related harm."